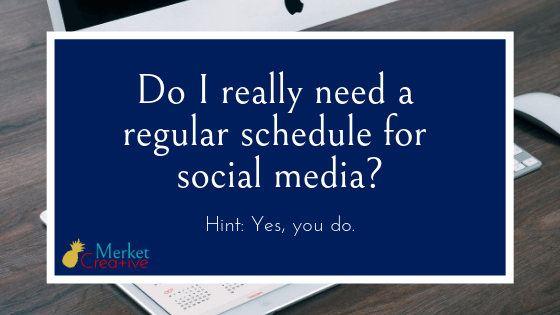 Do I really need a regular posting schedule for social media? Should you have a regular schedule for posting to social media? I saw this question posted in a business group today and nearly lost my mind. OF COURSE you should have a regular schedule for posting. Social media is a great experiment of expectations. I follow an embroiderer named Molly on Instagram who does the most amazing, intricate, and adorable hand stitches every single day. I don’t embroider. I have no interest in learning the craft. But I DO love the creativity Molly exhibits, and I’m inspired when I see her posts. Here’s the thing: I fully expect Molly to post her stitching every single day. And every single day she delivers. Molly is a great example of managing expectations with social media. She’s set the intention: post every day. And she shows up. Every day. Contrast this with other creatives, who post with the ebb and flow of inspiration. Creatives who post nothing for weeks and then overwhelm you with 17 posts in 3 days. Nothing is happening, then EVERYTHING IS HAPPENING AND YOU HAVE TO HEAR ABOUT ALL OF IT. Ugh. These accounts are exhausting to follow. And as a follower, I have absolutely no idea what to expect from them. When they do show up in my feed, I’m usually surprised, I’ll check out a post out of the sheer curiosity factor, but then I move on. I come to expect this type of poster as the all-or-nothing. They’re usually high maintenance, high drama, and very exhausting to deal with – even through social media. There is no trust building. There’s no expectation of anything of value. Ever. When posts DO show up, it’s usually self-promotion. “Check out this sale” “I’m doing this thing and you should check me out” “Buy now” … there’s absolutely nothing in it for the follower. Post to social media regularly. What does “regularly” mean? It totally depends on you. For the month of November, I posted twice a day – one gratitude post and one additional post, based on my own social strategy. I saw increased engagement, increased followers, and conversations with people outside of social media based on what I had posted. I worked on building trust and engagement during November – and it worked! My upcoming quarterly strategy is based on what I learned in the last quarter. Regular for me might mean something different to you. ESPN posts multiple times daily. Other accounts I follow post once daily. Some 3-4 times per week. But they’re consistent, and so an expectation is set. What’s the best time of day to post? I love this question so much. Start with best practices, which you can find by googling “best times to post on social media” – there are a million resources out there. But that’s only the first step. Start paying attention to when and how your followers interact. When do they like your posts most? When do they comment more frequently? When are they most likely to share? The more consistent you are with posting, the better your data gathering will be. With my clients, we review these analytics quarterly and adjust our schedule based on the data. Then we do it again the next quarter. The best time of day to post on various platforms totally depends on YOUR audience. Need help with this? Let’s create Your Simplified Strategy.